When 2015 is tallied for Texas A&M International University (TAMIU), it might be considered the year that propelled the University onto a larger national and international stage. The University’s prominence and visibility were measurably improved with a stunning series of rankings that helped to move the former regional university securely ahead. Those rankings included a first-ever ranking of Ninth in the Nation by The Economist, one of the world’s most prestigious weekly newspapers, which named TAMIU the only Texas institution in its Top 20. 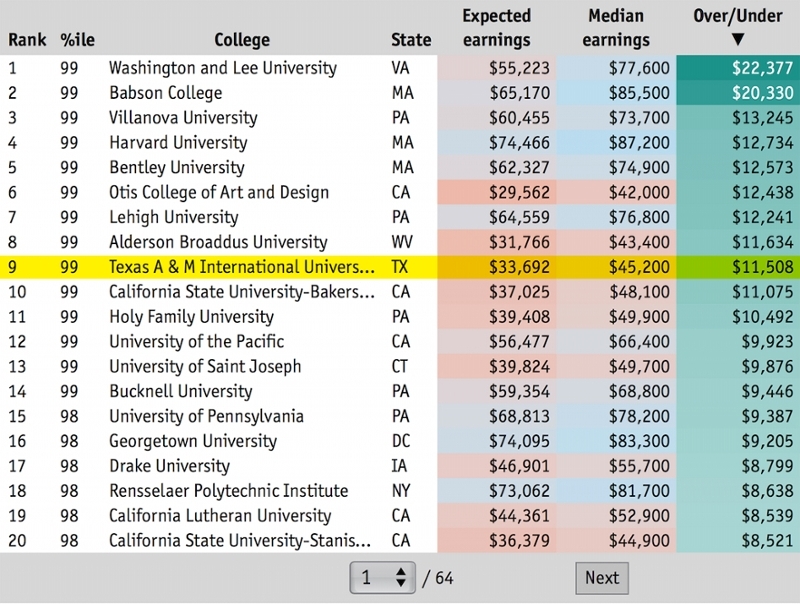 The ranking specifically looked at the college or university values, and those schools which boosted graduates’ salaries —and ranked colleges based on alumni earnings above expectation. • U.S. News & World Report ranked TAMIU No. 1 in U.S. among Colleges with Highest Hispanic Enrollment. • Washington Monthly Magazine ranked TAMIU 4th as “Best Bang for the Buck” among Southern Universities. • Money Magazine ranks TAMIU 5th for Best Value for Tuition, and “A” for value added. •US Department of Education ranked TAMIU 6th in Nation for Lowest Net Price. • Top Education Degrees ranked TAMIU 6th Most Affordable Online Master's in Curriculum and Instruction (C&I) degree program. • The Chronicle of Higher Education ranked TAMIU 8th among the nation’s fastest-growing Public Masters Universities. The Economist ranked TAMIU ninth among the nation’s Top 20 Colleges and Universities, and the only Texas institution in its Top 20. • TAMIU ranked 9th as the State’s Most Affordable Online College by Affordable Colleges Online for Texas universities and colleges offering online programs. • The MBA program in Business ranked No. 18 among the Top 50 Most Affordable MBAs 2014 category. • TAMIU ranked 21 among Best Colleges in Texas by Niche, a ranking based on academics and student feedback. TAMIU was highest among The Texas A&M University System campuses. • The MPA program ranked No. 31 among the Top 50 Online Master’s Degrees in Public Administration 2015 category. TAMIU president, Dr. Ray Keck, said that the rankings are important as the University positions itself for growth. “We want to realize the mission that the people of Texas have historically endorsed for TAMIU. Having the excellence of our faculty, students and programs repeatedly recognized by such barometers advances and helps us deliver that mission to a wider audience. We’re not content with being a best-kept secret, and these rankings attest to that. When we are ranked in this way, we do see it impact student interest and enrollment, so we’re eager to earn these rankings,” Dr. Keck observed. “This offers a comprehensive look at 2015, highlighting student and faculty accomplishments and TAMIU’s role in building legacies, cultivating leadership, inspiring innovation and forging partnerships. “It helps establish who we are: achievers, explorers and leaders -- but it also defines what we do: we achieve greatness, we challenge ourselves, we engage community, we lead daily and we give back. Seeing all that shared in the space of a year is an impressive offering that we’re excited to share with those we serve,” Dr. Keck said.